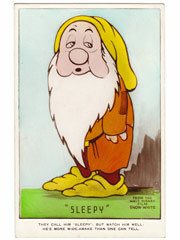 Real Photographic Postcard of Sleepy from the Disney Snow White film. In very good condition, Part of the Valentines Snow White and The Seven Dwarfs series. (Postcards, Cinema, Film, Disney, Screen).